MaxLite’s 55-watt LED Wall Packs are energy-efficient replacements for 250-watt metal halide fixtures. More than 80% more energy efficient than the fixtures they replace, MaxLite’s wall packs allow for a quick and maintenance-free upgrade to LED lighting. 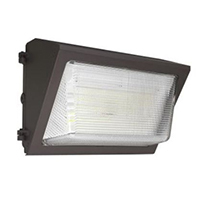 Deploying light only downwards with minimal glare, the fixtures meet cutoff criteria established by the IESNA. They have a long life of 150,000 hours and approved to be DLC Premium listed.